There’s no such thing as business as usual at The David Whitney. 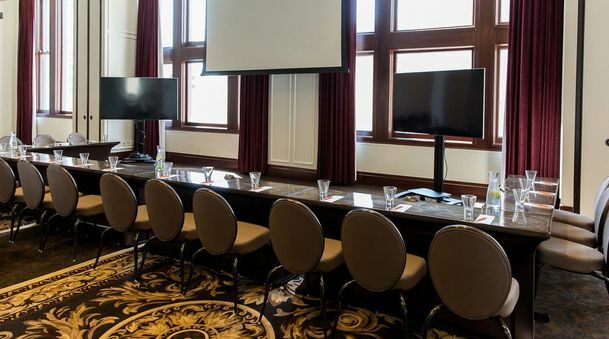 Connect, collaborate and create in style in over 6,670 square feet of inspiring event space, including the Aloft Tactic Boardroom. Add a little flair to your next meeting by welcoming your guests to The David Whitney Building, one of the most iconic landmarks in downtown Detroit. Sleek, functional and fully wired, the Aloft Tactic meeting room has been intelligently designed with everything you need to make your event shine, from state-of-the-art A/V set-ups and 50-inch flat-panel plasma screens to laptop hookups, DVD players, complimentary Wi-Fi, easels, flip charts and drawing boards. The David Whitney meeting space includes two 3,000-square-foot Ballrooms that can be split into three separate venues each. Together, the Tactic meeting room and our Ballrooms can accommodate as many as seven individual meetings.